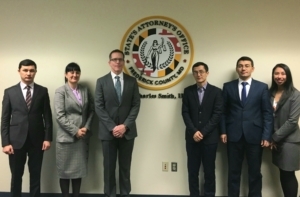 On March 12, 2019, the Frederick County State’s Attorney’s Office provided training to Uzbekistan prosecutors through the American Bar Association- Rule of Law Initiative’s International Justice Sector Education and Training (IJET) Program. 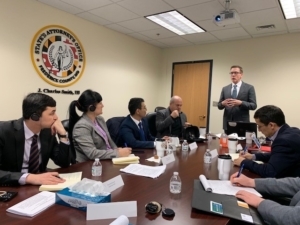 The training focused on case management, task forces, crime prevention, diversion programs, and targeted training for prosecutors and law enforcement. The IJET Program brings a small group of justice sector professionals to the United States for a month-long fellowship. The objective is to empower IJET Fellows to become agents of change for institutional or systemic reform in their country’s justice system. Each IJET Fellowship follows a highly tailored, structured model that includes a combination of seminars and training, peer-to-peer exchange, institutional visits, and an embedded mentorship with a leading U.S. professional. In addition to subject-matter experts, IJET Fellows work with experts in change management, outreach, and administration of justice to develop strategic, sustainable change plans that will create lasting impact. IJET is supported by a cooperative agreement with the U.S. Department of State, Bureau of International Narcotics and Law Enforcement Affairs (State/INL).